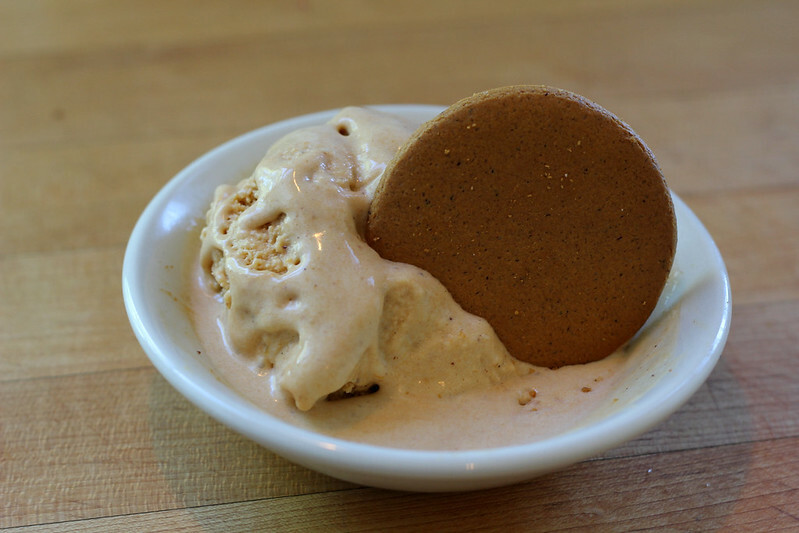 spicy gingersnaps + pumpkin ice cream (sandwiches). – !dpm does! For a Halloween-themed dinner this past Sunday (where we were the only ones who took to the theme, our own admittedly, of wearing black to eat orange…) we were charged with bringing dessert. The only requirement for said dessert was its color – orange – which left us with the obvious choice of making something pumpkin-y. The next obvious choice, pie, seemed a little uninspired. But what about pie, deconstructed…as ice cream sandwiches? 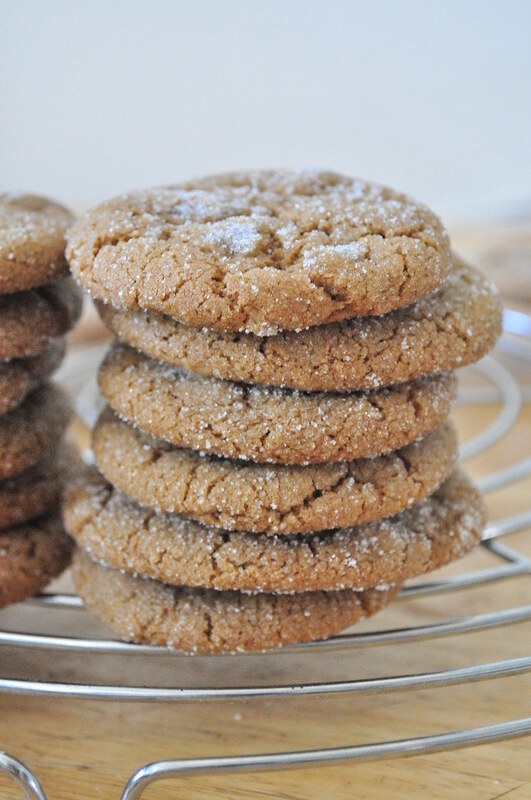 With pumpkin ice cream as the pie filling, and spicy gingersnaps as the crust? We thought about going recipeless for the ice cream. 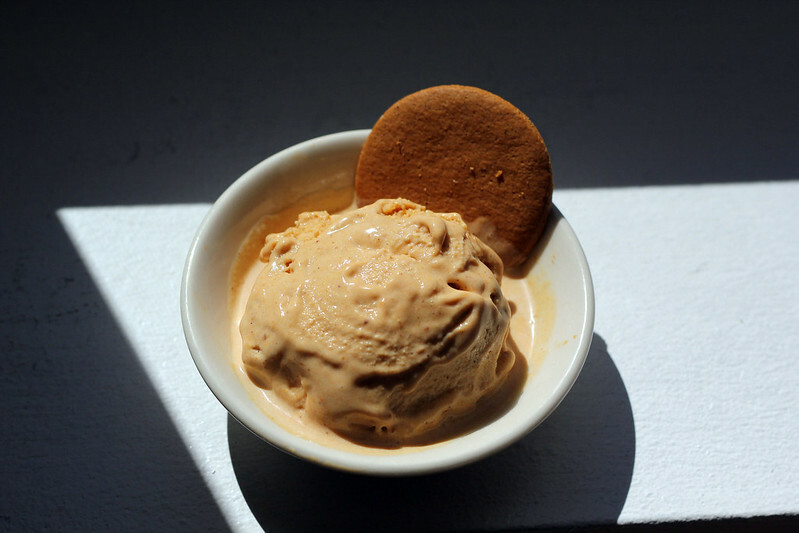 Figured, as we’ve yet to come across a pumpkin ice cream that truly tastes like pumpkin (same goes for beer – what is it about pumpkin that’s so elusive?) why not simply freeze the pumpkin pie filling we’ve been making for years, the one clipped from the side of can of Eagle Brand condensed milk? Sure, the eggs would be raw, but it would work right? We didn’t take the chance, and turned, instead, to our trusty David Lebovitz. He didn’t have a recipe of his own, but had some great things to say about his friend Karen DeMasco’s recipe. We were skeptical, and in our skepticism ended up making her recipe twice. In the first round, we were far more liberal with spice and puree than noted, and the results — both flavor and texture — were disappointing. In the second, we followed the recipe to the letter, and were shocked to discover that that elusive pumpkin taste is a scientifically balanced combination of many things, not just pumpkin. Lesson learned: don’t touch this recipe! It’s delicious — and actually tastes like pumpkin! 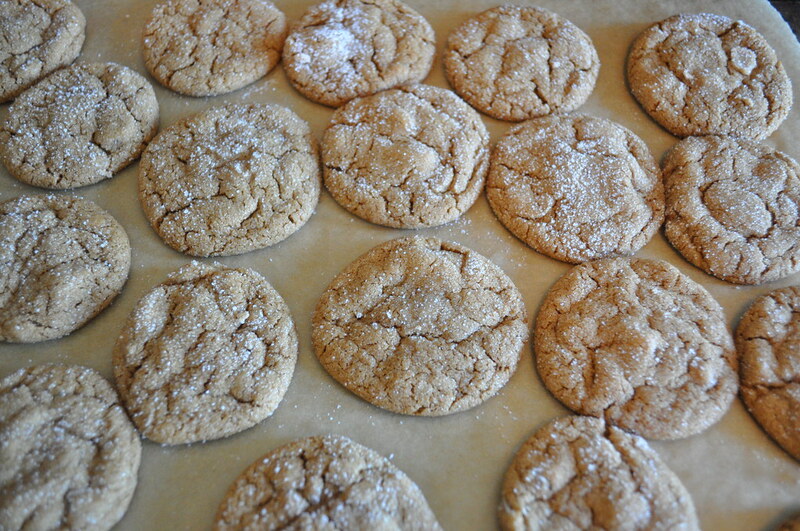 For the “pie crust” we went with chewy, spicy gingersnaps from Pithy & Cleaver. We love these cookies – the black pepper (killer secret ingredient!) and cocoa add a depth to the spicy ginger that makes them irresistible. And they’re chewy, almost pillowy, which lends itself well to sandwiching. These are cookies to sink your teeth into, and savor, slowly. The result? An intensely complex and delightful mouthful tasting of fall and holidays and many a childhood memory. Rather than make and freeze the sandwiches in advance, we simply brought out the pieces for guests to savor as they wished. But you could make them in advance — let the ice cream soften just a touch to make it easier to spread evenly, and wrap each sandwich tightly in wax paper for freezer storage. Note: We used canned pumpkin, as Karen suggests, mostly because homemade pumpkin puree has a lot of water, and we don’t have the tools to properly dehydrate the the pulp (which is an issue in ice cream, but not in, say, soup.) We did add a touch of Cognac, but just a teaspoon, less than what Karen suggested. Depending on the strength of your ice cream maker, you might want to skip this step if you’re going for something structural like ice cream sandwiches, since it does make for a softer ice cream. 1. Make an ice bath by putting some ice and a little water in a large bowl and nest a smaller metal bowl (one that will hold at least 2 quarts) inside it. Set a mesh strainer over the top. 2. In a medium saucepan, mix the milk, cream, granulated sugar, ginger, ground cinnamon, cinnamon stick, nutmeg, and salt. 4. Whisk the egg yolks in a separate bowl and very gradually whisk in about half of the warm spiced milk mixture, stirring constantly. This tempers your eggs. Go slowly, or they will scramble. 5. Scrape the warmed yolks back in to the saucepan and cook over low heat, stirring constantly and scraping the bottom with a heatproof spatula until the custard has thickened. A good way to test if it’s done is to draw your finger across the spatula – it should leave a clear mark, which indicates the custard is thick and ready. Don’t let it go too far, or you’ll end up with scrambled custard. If you want to be safe, use an instant read thermometer – it should read around 170F. 6. Immediately pour the mixture through the strainer into the bowl nested in the ice bath (this will of course strain out the cinnamon stick and larger bits of fresh ginger.) Mix in the brown sugar, then stir until cool and stick in the fridge. Chill thoroughly, preferably overnight. 2. In a medium bowl, whisk together flour, ground ginger, baking soda, salt, cinnamon, cocoa, and pepper. 3. In a large bowl, beat together sugar and vegetable oil. Add in the egg, grated fresh ginger, and molasses, and beat until smooth. 4. Fold in the flour mixture until well combined, then add in candied ginger. 5. Shape dough into 1 inch balls. Roll in (coarse) sugar and place on baking sheet. Bake 8-9 minutes until just set. 6. Let cookies cool for 3-5 minutes on cookie sheet, then remove to a wire rack until cool (if you move them too soon, they will break in the middle). Hey! It’s a premade wordpress.com theme with some customization. It’s hard to find a blog you like but there are lots of options out there! Previous Previous post: rosh hashanah. Next Next post: dulce de membrillo (quince paste).